Note: We are pleased to reprint this paper on the Colombian emerald mines. *Assistant Curator, Division of Mineralogy and Petrology, U. S. National Museum. 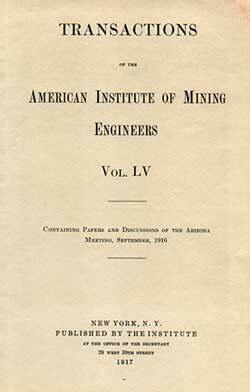 Title page from the journal issue containing Pogue’s paper. The writer visited the Muzo emerald mines in July, 1915, and spent six days in their study. 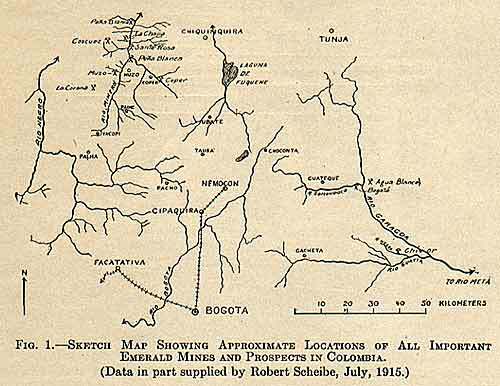 This paper embodies the results of his observations, plus information personally communicated by Robert Scheibe, Professor of Geology in the Mining Academy of Berlin, who at the time of the visit was completing a detailed field investigation of nearly a year’s duration of the emerald deposits of Colombia. An elaborate account of this valuable work may be expected at a future date from the pen of Professor Scheibe. The Muso emerald deposits are situated in the western foothills of the eastern branch of the Colombian Andes and are distant about 96 km.1 (60 miles ±) in a direct northwesterly line from Bogotá, the capital of Colombia (Fig. 1). They lie about 8 km. by trail west of the small village of Muzo in the Department of Boyaca, and embrace about eight great open cuts, closely grouped, occupying a portion of a steepwalled valley, that of the Itoco, also called Quebrada del Desaguadero, an affluent of Rio Minero which empties into the northward-flowing Magdalena, the great artery of commerce for central Colombia. Though distant but 33 km. 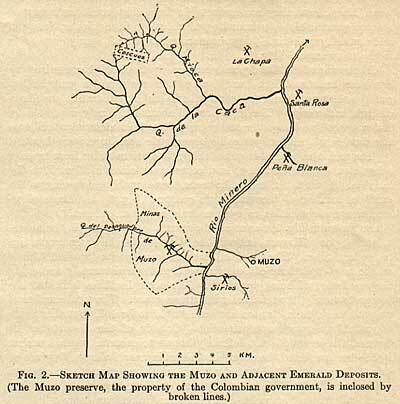 from La Dorada, the head of steam navigation on the lower Magdalena, they are inaccessible from that point, and may be reached practicably only from Bogotá via rail to Cipaquira or Nemocon and thence by mule for 2 1/2 days over an execrable trail, nearly impassable in the rainy season2 (Fig. 1). The region about the deposits is intensely tropical, characterized by excessive heat and high humidity, with a rank jungle growth that quickly obscures abandoned workings and makes exploration peculiarly difficult and costly.3 The region round about is sparsely inhabited by Indians who live in squalor and poverty — modified descendants of warlike aborigines, docile and peaceable, even servile, speaking a Spanish patois. The region in general is unhealthful; the natives suffer from tropical anaemia, malaria, dysentery, and other complaints incidental to the latitude. Work in the mines, however, is reasonably safe owing to the excellent location of the workmen's quarters (Fig. 3) and the medical attention and sanitation enjoyed under recent management. As shown in Fig. 1, the emerald occurs at other points in the mountainous region of Boyaca, but only the Muzo locality has been productive in modern times. The so-called Somondoco deposits (marked Chivor on the map) and those of Coscuez are important historically and enjoy the reputation of being very rich. The other localities indicated are prospects merely, though locally known as minas. The total number of emerald localities in Boyaca has been stated to be 157,4 but this figure is probably a rough approximation. 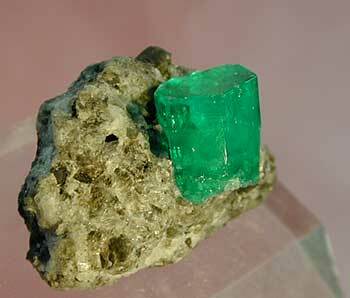 Outside of the Department of Boyaca, the emerald is not definitely known to occur in South America. It has been reported, however, in Colombia near Bolivar, Province of Velez, Department of Santander,5 and tradition points to the Manta Valley near Puerto Viejo in Peru as a source,6 but it seems probable that all the “Peruvian” emeralds came from the Colombian deposits. The present section is preliminary to a fuller study under preparation on the history and archeology of the emerald in South America. The early history of the Muzo deposits is buried in the remote past. These, in common with the Somondoco (Chivor) and Coscuez deposits, had long been worked when the Spaniards first set foot in the New World.7 The three formed the principal, probably the sole, sources of the precious green stone that the Spaniards found so widely distributed through northwest South America and particularly in the realm of the Incas in Peru–a product that shared with gold in the role of inciting the cupidity of the invaders and enticing them to brave the dangers of the unknown interior. About the year 1594 the Spaniards succeeded in finding the Indian workings nearby at the site of the present-day Muzo mines,15 and then commenced active work and for some 15 years or more the output was considerable.16 The production, however, soon fell away, owing to labor difficulties,17 and toward the middle of the 17th Century the Spanish Crown, whose fifth portion18 had dwindled, reorganized the industry under the direction of the Royal Treasury. Its administration seems to have been singularly inefficient; excessive labor in the mines was imposed on neighboring tribes, a burden resulting in heavy mortality and serious depopulation of the region; dishonesty on the part of both workers and officials19 still further lessened the output; and the galleries that were earlier worked were abandoned for open-cut operations, a change not immediately productive of results. Ineffective mining continued to the middle of the 18th Century or thereabouts, when a disastrous fire terminated activities for a time. Work was later resumed but prosecuted only in a desultory fashion until the success of the War of Independence in 1819 transferred the holdings to the new-born Republic. The republican Government at the outset lacked the organization necessary for running the mines, but realizing their possibilities as a source of revenue, soon contracted for their private exploitation, the terms being 10 per cent. of the net profits.20 The mines were worked under lease from 1824 to 1848,21 when Congress in Bogotá decreed that all emerald deposits found in the country should be worked under the direction of the nation.22 This decree does not seem to have been strictly adhered to, for contracts with private parties were subsequently entered into by the Government, some being in the nature of partnerships, others being strict concessions. It would be scarcely profitable, even if trustworthy data were available, to follow in detail the vicissitudes of the various arrangements made from 1848 to 1909.23 Suffice to say that the Muzo mines were worked almost continuously during that period, but their development suffered from a lack of any sustained policy of administration as well as from the want of engineering and geological advice. In 1909, the Government closed a partnership contract with an English company, The Colombian Emerald Mining Co., Ltd., controlled by South African diamond interests,24 and the deposits were actively exploited for a time; but after a few years the contract was rescinded25and the Government reassumed sole control of the mines. Operations have been totally suspended, however, since Jan. 1, 1913, owing to the fact that the appropriations for administration and exploitation, being entirely insufficient for reestablishing mining activity,26 were applied merely to the maintenance of the property. The European War, in its effect on the precious stone market, precludes profitable exploitation in the immediate future. Red sandstone with septarian nodules. Compact sandstone; gray fossiliferous limestone between two layers of gray shale with plant impressions. Black, carbonaceous shale and shaley limestone. Carries Muzo emerald deposits and Cipaquira salt deposits. Siliceous schists and conglomerates, with jasper, flint, etc. These rocks are compressed into great north-south folds and igneous phenomena are largely lacking. 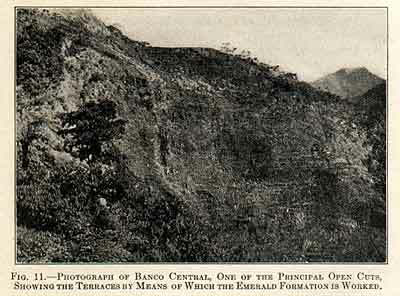 General.–The geological relations of the emerald deposits are well exposed in the great open cuts made in exploitation of the emerald veins, but the surrounding conditions are almost completely hidden by dense jungle growth (Fig. 3). The emeralds are found almost entirely in calcite veins that traverse a black, carbonaceous, rather intensely folded formation consisting of thin-bedded shale and limestone (Fig. 4). This emerald formation29 lies discordantly30 upon steeply dipping strata, barren of emeralds, composed of heavier beds of carbonaceous limestone intercalated with black shale, and called the Cambiado from the Spanish word cambiar, to change. Between the emerald formation and the Cambiado and ever in close proximity to the plane of discordance are three rock types of great significance in furnishing direct evidence of the origin of the emeralds. These are (1) albite rock, (2) a light-gray rock composed of a soft granular aggregate of calcite, dolomite, quartz, pyrite, and other minerals, called by the miners Cenicero (Spanish cenicero = ash) in allusion to its ash-like appearance, and (3) aggregates of large, well-formed calcite rhombs in a fine-grained matrix, forming rock masses known locally as Cama, from the Spanish word cama, meaning bed.31 In addition, a few pegmatite veins have recently been discovered in the deposits. The shale-limestone beds are gently to severely folded, in places contorted (Figs. 5 and 7). The folds are small, irregular in strike and pitch, non-persistent, and lie in all directions; in short, they indicate no general direction of compression. Their disposition suggests local rather than regional pressure. Fractures are prominent, for the most part healed by calcite and consequently marked by veins and seams of white. Well-defined joints are inconspicuous; faults are present, but, with the exception of the plane of overthrust separating the emerald formation and the Cambiado, are for the most part not easily traced. The emerald is seldom found in the shale or limestone alone. Its usual home is the calcite veins. In many places the beds carry nodules of pyrite or seams of that mineral in well-crystallized condition; and some phases are shot through with well-formed pyrite crystals. 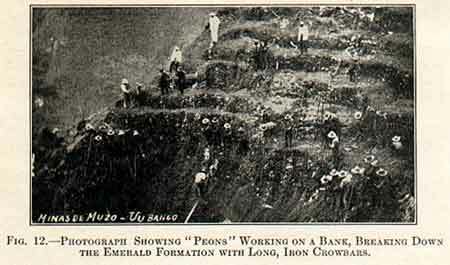 The emerald formation rests discordantly upon the Cambiado. The plane of discordance is usually found to be sharp and clear-cut; in many places it is marked by the presence of albite rock, Cama, or Cenicero. The Cambiado.– (See Figs. 8a and 8b). This formation consists of beds of black, crystalline limestone, averaging in thickness about 25 cm. and alternating with thin-bedded shale similar to that of the overlying emerald formation. The limestone shows itself under the microscope to be composed of ragged, granular masses of calcite, inclosed in black carbonaceous matter, and carrying a few to many fragmental crystals of albite. 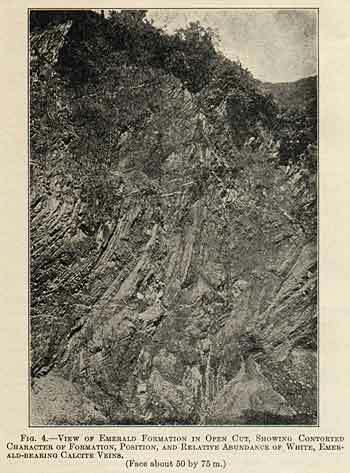 This rock in places grades upward into a phase in which albite predominates, the so-called albite rock described later; downward it grades presumably into albite-free limestone, but only the topmost few meters of the Cambiado are in any place exposed. The beds dip steeply, in general about 60°, to the south, and are fairly uniform in structure wherever exposed. They are traversed by calcite veins, some following fault planes as in Fig. 8a, barren of emeralds, and carry seams, nodules, and scattered-crystals of pyrite but in less quantity than the emerald formation. Some thin albite veins have been found33 in the Cambiado of Banco Central. The discordance between the uniform dip of the Cambiado and the contorted character of the emerald-bearing strata is conspicuous in many exposures; in some the line of separation is difficult to detect. The surface of the Cambiado, that is, the plane of discordance, is exceedingly irregular, characterized by sudden changes in inclination, steep slopes, and prominent hollows. Its general shape is that of a huge bowl-like basin with undulating bottom. Its topographic configuration is so complex, its horizontal development so subordinate, that, apart from the fact that the overlying beds are intensely folded while the underlying ones have uniform inclination, it seems evident that the contorted emerald-bearing strata have been shoved bodily into their present position upon the Cambiado. The presence of some brecciated shale and marked mineralization along this plane, as well as evidences of faulting and drag in the upper part of the Cambiado (Figs. 8a and 8b), corroborates the interpretation of overthrust. Albite Rock.– In places the upper edges of the Cambiado strata grade into a granular, grayish rock in which laths of plagioclase feldspar from 1 to 3 mm. in length are thickly set in a greenish-black ground. The microscope shows the feldspar as clear laths and irregular crystals of albite dominating a groundmass of calcite dusted and stained with carbonaceous material; the albite is distinctly later than, and replaces, the calcite. Some portions of the rock are almost wholly albitized; other portions, in addition to albite, carry disseminated rhombs of yellowish dolomite; in places albite seams 5 mm. in thickness are found; and small druses carrying splendid crystals of albite as well as crystallized calcite and dolomite are not uncommon. The albite rock clearly represents a phase of the Cambiado limestone that has been metamorphosed by mineralizing solutions (or vapors), part of the calcite having been displaced and albite added. The relation of the albite rock to the Cambiado and also to the Cenicero is shown in Fig. 9. The Cama.– This formation is composed of conspicuous rhombs and rhombic twins of calcite, most of them from 5 to 10 cm. in diameter, set in calcareous cement along with some quartz, the whole forming a breccia-like mass (Fig. 10). The habit of the calcite, which occurs as unit rhombohedrons alone or modified by base, and as twins of the first-named form with (1010) as the twinning plane, probably reflects the temperature range of development.34 This formation rests directly upon the Cambiado, but is not continuous, being found only here and there, either alone or close to the somewhat similarly occurring Cenicero (see Fig. 10). The Cama in places shows plainly a connection with calcite veins both in the emerald formation above and in the Cambiado below. Some calcite veins in the latter have the peculiar calcite crystallization of the Cama. 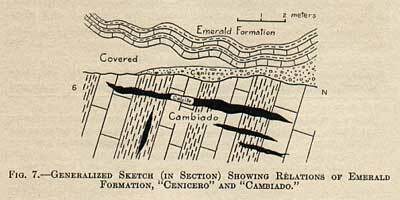 The Cenicero.– This formation occurs as irregular lenses or beds up to a meter or so in thickness present in many places between the emerald formation and the Cambiado, either with or without the Cama (Fig. 10). It is connected below with the albite rock, into which it locally grades, but unlike the Cama, shows no connection with the calcite veins traversing the overlying and underlying formations. In a few places it was noted forming vein-like bodies in the emerald formation itself. The ordinary Cenicero is a crumbly, light-gray aggregate of crystals, chiefly of calcite, dolomite, quartz, and pyrite. A typical specimen under the microscope shows the minerals noted as well-formed, fragmental, and rounded crystals, set in a fine-grained ground, difficultly resolvable, but probably mainly calcareous matter, stained with a little carbonaceous matter. Toward its top the Cenicero in many places carries abundant fragments of black shale a centimeter long and smaller, forming masses of breccia rarely seen over 2 m. in thickness. There are three more or less strongly marked phases of the Cenicero– dolomitic, pyritic, and baritic–the normal sequence upward being in that order (Fig. 9). In addition, the lowermost part in many places is albitized, while the topmost portion is nearly everywhere connected with the emerald formation by the breccia phase just noted. The baritic phase is locally seen as an almost pure layer of massive to nodular barite, with a maximum thickness of about 40 cm. Pegmatites.– Pegmatite dikes were discovered in 1915 by Robert Scheibe in the Cambiado near Banco Amarillo and in a ravine back of Banco Central. The last-named locality was visited35 and the pegmatite, here about 2 m. in width, found to consist of quartz, in part well crystallized (the low-temperature form), and decomposed feldspar, together with a few crystals of albite and apatite, much greenish to clear allophanite, many small form-rich crystals of pyrite, and a little hyalite. The Muzo deposits present a notable assemblage of minerals, many of them well developed crystallographically and some of particular chemical interest. The present section assembles the geologically significant characteristics of these minerals, but attempts no detailed mineralogical description. A good crystallographic study was published in 1904 by H. Hubert36 and an accurate mineral list with brief characterizations in 1915 by Lleras Codazzi.37 The statements here given are the results of the writer's observations, except where otherwise noted. Choice specimens show a rich green color surpassed by the product of no other locality. Some crystals display zones of color; a few are dark to black with inclusions of carbonaceous matter. In some specimens recently found, the carbonaceous matter is arranged in a six-rayed figure centering about a tapering hexagonal core. One such specimen was examined optically in basal section and proved to be of the same orientation throughout; it therefore does not represent a twinned crystal as suggested by Lleras Codazzi.39 Its re-entrant angles are presumably the effect of solution and the disposition of the carbonaceous inclusions, the expression of crystallizing forces, as shown also, for example, in chiastolite. A stunning example of a Colombian emerald in matrix. This specimen is that pictured in the John Sinkankas painting at the top of the article. (Photo: Harold & Erica Van Pelt). Calcite.– Forms emerald-bearing veins in the emerald formation and barren veins in the Cambiado, and is well crystallized where occurring in vugs. Crystals are water-clear to opaque from disseminated carbon; they show a rich variety of forms, with two dominant habits, rhombohedral and prismatic. Closely associated with emerald, pyrite, and parisite. Occurs in the Cama as conspicuous unit rhombohedrons (some modified by base) and as rhombic twins, twinning-plane (1010). Is an important component of the Cenicero as small rhombs and grains. Dolomite.– Occurs as small, transparent, honey-yellow rhombs in the emerald veins and in the Cenicero. Pyrite.– Occurs in well-formed crystals in the emerald veins; as seams, disseminated crystals, and concretions in the emerald formation; as crystals in the Cenicero; and as crystals and concretions in the Cambiado. The crystals, which range in diameter from a fraction of a millimeter to several centimeters, show a profusion of crystal forms and present three habits, cubic, octohedral, and pyritohedral. Parisite.– This rare mineral, of the composition (CaF)(CeF)Ce (CO3)3,41 was first discovered in the Muzo mines by J.J. Paris, a lessee of the deposits, and named in his honor by Bunsen,42 who investigated the mineral. 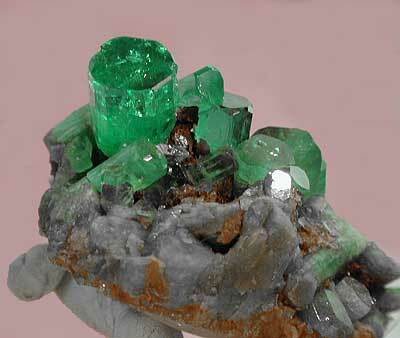 It occurs as crystalline masses and crystals in immediate association with the emerald. The crystals are double hexagonal pyramids, with or without the base, and most are under 1 cm. in length. Fluorite.45 – Occurs as small, colorless to greenish crystals in some of the emerald veins; very rare; forms are cubes or cubes modified by small octahedrons; inclusions of emerald noted.46 Has also been noted by Scheibe (oral communication) in the albite rock at one spot. Apatite.– A few, well-formed, glassy crystals have been found by Scheibe in the emerald gangue and in the pegmatite vein back of Banco Central. Gypsum.– Present in the emerald formation as well-formed, clear, slender crystals. Presumably a weathering mineral, but Lleras Codazzi47 noted inclusions of parisite, and Olden48 mentioned green gypsum as an associate of the emerald. A fine emerald in matrix from Chivor, Colombia. Specimen: Pala International, US$6,800/piece. Ask for Inv. #3967. Albite.– Occurs as a conspicuous component of the albite rock and as small glassy crystals rich in forms49 in druses in this rock. Found also in one phase of the Cenicero and as microscopic crystals in the Cambiado. Barite.– Occurs in conspicuous layers, up to 40 cm. or so in thickness, forming in places the uppermost part of the Cenicero; this phase is nodular to massive.50 Found also as small, glassy, tabular crystals, 2 mm. 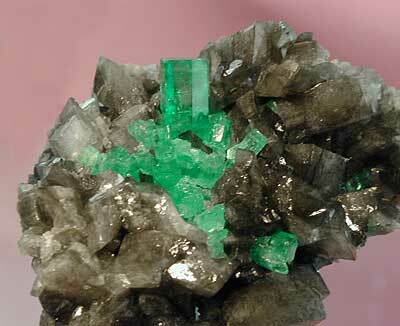 across, associated with crystallized calcite in some veins in the emerald formation. 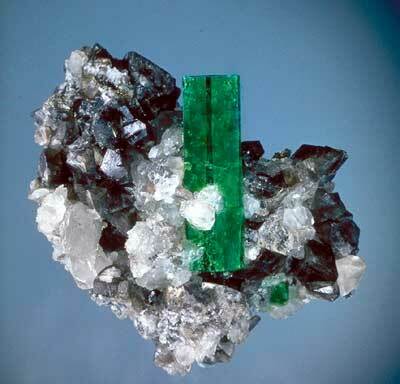 A small crystal perched on an emerald crystal has been noted by Scheibe. Marcasite.– Noted by Lleras Codazzi52 in the form of nodules. Chalcopyrite.– A few imperfect crystals, stained with a little malachite and azurite, have been found in the workings. Also occurs sparingly in the Cenicero. Native Sulphur.– Found in conspicuous masses in parts of the Cenicero. Pyrophyllite.– Occurs as apple-green folia, occupying small, inconspicuous seams in the emerald formation; found either alone or associated with dolomite, pyrite, and quartz. Allophanite.– Found only locally developed in clay-like masses forming lenses in the emerald formation. Noted by Lleras Codazzis53 in blue masses in a vein in the Cambiado. Fuchsite.– Noted by Lleras Codazzis54 as green laminae adhering in places to the surface of the shale of the emerald formation. The ages of the emerald formation and Cambiado are fixed as Cretaceous by the fossils, chiefly ammonites, that have been found rather abundantly in them. Miguel Gutiérrez55 places the Cambiado as lower Cretaceous56 and the emerald formation as middle Cretaceous.57 The present writer presents no fossil evidence but feels that further paleontological study is needed before a correlation closer than “lower Cretaceous” can be accepted for the rocks of the emerald deposits. An ammonite collected by the writer from the stream bed below the workings has been identified by Dr. T.W. Stanton as Pulchellia zaleatoides, Karsten, from the upper part of the lower Cretaceous. 1. The association of such minerals as emerald, parisite, fluorite, apatite, albite, and barite in a sedimentary formation implies the introduction of material from an external source. This is so obvious from the composition of these minerals and their known occurrence elsewhere as to render further elaboration unnecessary. 2. The presence of pegmatites is significant, because the conditions under which pegmatites form are fairly definitely understood. The mineral content of the pegmatites is thought to correlate their formation with the general period of mineralization. 3. The presence of albite rock (highly albitized limestone) and its spatial relation to a zone occupied by the Cenicero and Cama indicate the passage of strongly effective mineralizing solutions. The albite rock itself is thought to represent a contact rock, not of the normal type (because of the absence of such characteristic minerals as garnet, epidote, pyroxene, amphibole, etc.) but of the type characterized by V.M. Goldschmidt58 as that due to “pneumatolitic contact metamorphism,” a type that develops later in the cooling of, and more distant from, the parent magma than the normal type. 4. 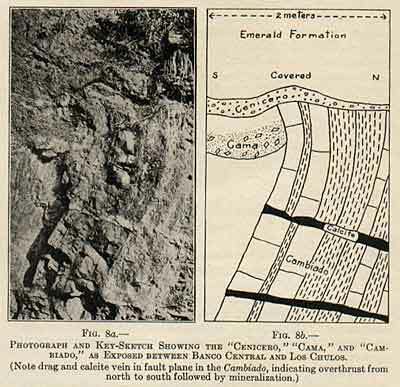 Structural conditions indicate that the emerald formation was overthrust to its present position upon the Cambiado, and that this movement was followed by a period of mineralization which attained its most conspicuous results along the fault plane and its economic results above (and not below) that plane. That the emerald veins are the result of the same period of mineralization that produced the Cenicero, Cama, and albite rock, is thought to be clearly indicated by the mineral content and spatial connection that may be traced between the four. The barren calcite veins in the Cambiado are probably of the same period of mineralization also; for they are post-faulting (Figs. 8a and 8b) and in places are connected with the Cama. A fine emerald in matrix from Colombia. Specimen: Pala International, US$10,000/piece. These considerations together present practically conclusive evidence that the emerald is one effect of a period of mineralization growing out of the intrusion of a body of igneous rock. That exposures of this rock have not been thus far discovered should have little weight as evidence. We may infer further that the emerald was deposited under gas-aqueous (pneumatolitic) conditions, although the general temperature of mineralization throughout was probably below 575°. Other inferences may be drawn and suggestions made. It is possible that the overthrusting and folding of the emerald formation is due to the crowding effect of the igneous intrusion; this makes an attractive and reasonable hypothesis. Then, the fact that the veins of the emerald formation carry emeralds, while those of the Cambiado are barren, or, in short, that the emeralds all lie above the plane of overthrust, although non-economic mineralization proceeded below, suggests that the solutions, entering along the shattered fault plane, effected a separation there, their liquid portion permeating the rocks on either side, their gaseous portions rising and therefore recording passage (by emerald deposition) only in the rocks above. The presence of the two unusual types of deposits, the Cenicero and Cama, raises a difficult question; but it seems probable that the Cenicero was first deposited, following close on to the faulting movement, and then the Cama was introduced and, accompanying it (farther out from the fault plane), the calcite veins were developed. Again the carbon content of the emerald formation interposes itself as a common factor, suggesting the possibility that it may have been essential to the formation of the emerald in some way, either by its precipitative action, or by its reducing action on chromium, the coloring agent of emerald. Finally, the question arises as to the source of the calcite so prominent in the seams and the veins throughout, and it appears probable that the calcium carbonate displaced from the Cambiado upon its albitization is sufficient to form these bodies, without magmatic contribution of that material. The emerald is won exclusively by open-cut mining. The steep slopes of the emerald formation, stripped of their covering of jungle, are worked in great terraced banks (bancos), affording benches60 on which lines of peons stand and attack the bench below with long iron crowbars (Figs. 11 and 12). The comparatively soft limestone and shale are easily broken away in this way without recourse to blasting (which would shatter the fragile emerald crystals) and the emerald-bearing calcite veins are carefully removed by hand and taken to a sorting shed above. 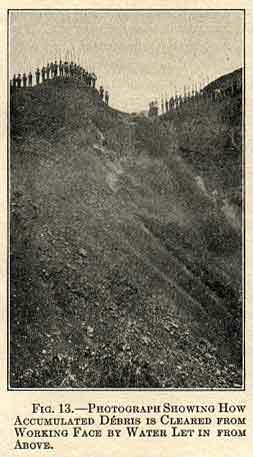 The debris falls down the step-like slope and the accumulation at intervals is swept down to the creek below by water led from reservoirs in the mountains above the workings (Fig. 13). In the sorting shed, the calcite veins are carefully broken by hand and the emerald crystals picked out. The finer material, together with gem-bearing debris gathered from “bed-rock” and from the water channels below the banks, is washed on sloping tables and the emerald fragments withdrawn by boys (Fig. 14). The stones are separated into a number of grades according to color, size, transparency, and freedom from flaws. The product goes by mule to Bogotá from time to time, and there awaits transportation to London in larger consignments. The labor is done by Indian peons drawn from the neighborhood. Mining officials and police are supplied from Bogotá or other towns. Great vigilance is exercised, when the mines are in operation, to reduce loss by theft. A body of military police is assigned to the mines; the exits are carefully guarded; watchmen are always on duty in small guardhouses on prominent points above the workings; overseers are in constant attendance during hours of work; and the workmen are impounded and not allowed to leave the mines until the culmination of a suitable period of search. The mine buildings are commodious and comfortable, maintained in good condition (Fig. 3). The mining equipment is simple, but the fragility of the emerald precludes the use of most types of equipment that would increase the quantity of ground handled. It is impossible to present an approximation of the total production of the Muzo mines. The pre-Spanish output, undoubtedly significant, is of course not open to any measure. In historic times, the exploitation was so irregular and the records so incomplete, that a fair basis for judgment is entirely lacking. Nevertheless, it is certain that the total output may be estimated in terms of tens of millions of dollars, and that in many single years the production has run in value from $1,000,000 to perhaps $2,000,000, or more. The Coscuez and Somondoco emerald deposits have already been mentioned as the only other important known occurrences of this mineral in South America. Somondoco Deposits.– These lie about 130 km. in direct line southwest of the Muzo mines on the Orinoco watershed (Fig. 1), and a careful survey of available information suggests that possibly they are richer than the Muzo deposits. 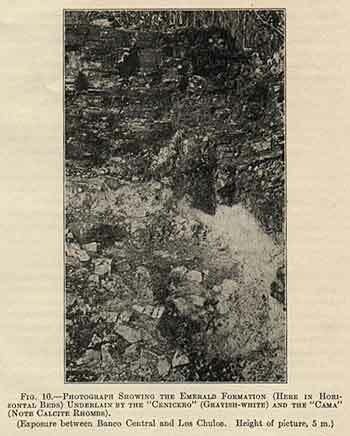 They have been visited and described by W. Lidstone62 and by E. B. Latham;63 and in 1915 a detailed geological survey of them was made by Robert Scheibe, but the results are not yet published. These deposits have a romantic history. They were richly productive before the Spanish Conquest, were seized and worked a while by the Spaniards, were subsequently abandoned and lost, and only rediscovered in 1896.64 They have not been productive in recent times, though foreign capital has interested itself in their exploitation. According to Latham65 the emerald here occurs in veins of “semi-decomposed quartz” traversing folded beds of dark gray to black “clay-slate” and limestone, and is found either directly embedded, or in pockets, in these veins, very rarely in the rock itself. Lidstone66 describes the occurrence here in a similar manner, without, however, specifying the vein matter to be quartz. For courtesies and valuable help, both during the writer's visit to the Muzo mines, and later during the preparation of this paper, the writer extends his appreciative acknowledgment to the following: Hon. Marco Fidel Suárez, Minister of Foreign Affairs, Bogotá; Hon. Daniel J. Reyes, Minister of Hacienda, Bogotà; Hon. Thaddeus A. Thompson, American Minister, Bogotá; Dr. Juan de Dios Vasquez, Director of the Muzo mines; Dr. Alfredo Angueyra, Acting-Director of the Muzo mines at the time of the writer's visit; Prof. Dr. Robert Scheibe, Professor of Geology, Royal Mining Academy, Berlin; Dr. Ricardo Lleras Codazzi, Professor of Mineralogy and Geology, National University, Bogotá; Dr. Lucas Caballero, Bogotá; Dr. Hermano Apolinar Maria, Bogotá; Phanor James Eder, New York; Douglas B. Sterrett, U. S. Geological Survey, Washington; Dr. George P. Merrill, and Dr. Edgar T. Wherry, U. S. National Museum, Washington; Dr. Ronald S. Crane, Evanston, and Mrs. Leonard G. Shepard, Evanston. Dimas Atuesta: Informe relativo al levantamiento de los planos y mensura de los Terrenos de las Minas de Esmeraldas de Propriedad de la Nacion, manuscript, 1898. (Consulted at Muzo Mines. English translation on file, U. S. Geological Survey, Washington.) Description, chiefly historical and geographical, of the Muzo and Coscuez deposits. Inaccurate. Max Bauer: Precious stones, English translation by L. J. Spencer, pp. 312 to 315. London, 1904. Carefully compiled geological, mineralogical, and historical account of the Muzo deposits. Miguel Gutiérrez: Estudio Geologico de las Minas de Esmeraldas de Muzo, Anales de Ingeniería, pp. 3 to 14 Bogotá (1913). Gives results of field study of Muzo deposits. Observations incomplete; interpretations open to question. H. Hubert: Sur les Minéraux associes a l’Emeraude dans le Gisement de Muso (Nouvelle-Grenade), Bulletin Musee d’Histoire Naturelle, vol. 10, pp. 202 to 208, Paris (1904). Detailed crystallographic study of emerald and associated minerals from Muzo. Ricardo Lleras Codazzi: Los minerales de Muzo, Contribución al estudio de los minerales de Colombia, Imprenta de la Cruzada, pp. 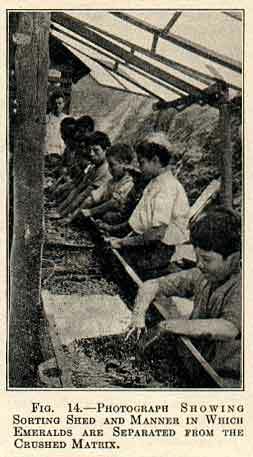 3 to 7, Bogotá (1915). Good, brief description of the Muzo minerals. 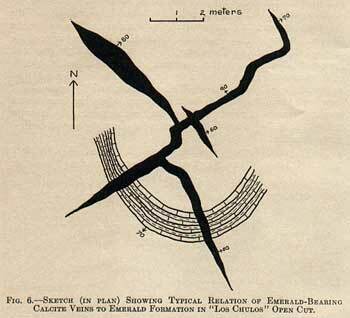 Charles Olden: Emeralds: Their Mode of Occurrence and Methods of Mining and Extraction in Colombia, Transactions of the Institute of Mining and Metallurgy, vol. 21, pp. 193 to 209 (1911). Good account of mining methods at Muzo. Includes geological description and historical details, the latter in part unreliable. A. Stülbel and W. Reiss: Geologische Studien in der Republik Colombia, Reisen in Süd-Amerika, vol. 2, pp. 43 to 48, Berlin (1899). Geological and mineralogical description of the Muzo deposits. H. A. Schumacher: Ueber die columbischen Smaragden, Zeitschrift der Gesellschaft für Erdkunde zu Berlin, vol. 10, pp. 38 to 62 (1875). A detailed and valuable historical description of the Muzo mines, based on original sources. EDGAR T. WHERBY, * Washington, D. C. (communication to the Secretary†) .–Dr. Pogue’s presentation of the facts concerning the emerald deposits is very clear and convincing, and the only addition that I can suggest is a summary of previous theories of origin. He makes it evident that the pegmatite theory is the only one capable of explaining the existing relations, but upon certain details there may be some difference of opinion. If I understand the term pneumatolytic, it does not imply that all the elements concerned in a given deposit were transported as gases, but rather that the crystallization of these elements into the various minerals was favored by the presence of certain gaseous substances, notably H20, CO2 and HF. It is highly improbable that the oxides of glucinum, aluminum, chromium, and silicon, which enter into the composition of the mineral emerald could have been transported in the gaseous form. The same is true of the metallic constituents of the parisite and other associated minerals. The explanation suggested, that solutions separated into liquid and gaseous portions, the latter ascending and forming the emerald in the upper portions of the rock only, therefore, seems to me untenable. When two formations exist side by side and one, A, is mineralized while the other, B, is barren, the possible explanations may be classed as (1) chemical, and (2) physical. 1. Some chemical feature of A not found in B might have caused crystallization of certain minerals in the former, which did not appear in the latter. In the present instance both rocks appear to be so similar chemically that no such effect can be looked for. Pogue mentions carbon as a possible precipitating agent, but describes both formations as carbonaceous, so that the difference in the minerals of the two can not be thus explained. 2. The physical condition of A might have permitted or encouraged the passage of the solutions, while that of B retarded or prevented it. In the present deposit some mineralization occurs in both formations, calcite veins, albite, and pyrite being found in both, whereas emerald, parisite, and a number of minerals of minor importance occur only in the upper, A. It seems to me that this difference may have been produced by a change in the composition of the solutions during the progress of mineralization; at first these brought in only the constituents of albite and pyrite and deposited them with calcite dissolved from the wall rock, in both formations; the openings in B became completely filled, while the more numerous or larger ones which would naturally have developed in A, since it was the uppermost formation, remained partially open. Then, when during later phases of the mineralizing activity the constituents of emerald and parisite appeared, they were deposited only in A because B had become impermeable. * Associate Professor of Geology and Mineralogy, Northwestern University. Jorge Juan and Antonio de Ulloa: A Voyage to South America, translated from the Spanish, 3d ed., vol. 1, book 6, Chap. 9, p. 466, London, 1772. The statements above are based principally upon Schumacher, who seems to have made a fairly thorough search into a number of original sources not yet available to the present writer. Acosta (Compendio histórico del descubrimiento y colonización de la Nueva Granada, Paris, 1848; Bogotá, 1901, English translation in manuscript by Isabel Sharpe Shepard, Chap. 18) gives a somewhat different version: He writes that a few years after the founding of Muzo, the Spaniards discovered the present Muzo deposits and began mining operations there in 1568; a rich vein was found prior to that date at Abipí, 2 1/2 leagues distant, but was not worked, for lack of water, and its whereabouts became lost.